In March 2011, the Warmun Community in the East Kimberley region of Western Australia, was devastated by a flash flood, which destroyed most of the community buildings and infrastructure. The Warmun Art Centre itself experienced considerable damage and loss. The Warmun Community, including most of the artists were evacuated 200 km north to Kununurra. The Warmun Art Centre is an incorporated Aboriginal enterprise established in 1998 by Warmun (Turkey Creek) artists. The Centre is owned and managed by artists will all proceeds of art sales going back into the community. There are currently 80 active artists who are members of the Warmun Art Centre. There is a core group of eleven senior artists who learnt from the first generation of Warmun painters, who included Jack Britten, Rover Thomas, Hector Jandany, George Mung Mung, Rusty Peters and Queenie McKenzie. Today's senior artists are still painting and active in directing the Art Centre business and culture. Children and grandchildren, and in some cases the great grandchildren, make up the majority of current active artists. Warmun Art Centre is a key repository for cultural knowledge and artefacts of the Gija people, through the recording of stories and artworks and because it holds the historically significant Warmun Community Collection. The Collection is comprised of around 340 objects, which include paintings on hardboard, canvas, cardboard, cement sheet, and plywood, and wooden carvings and sculptures. The Community Collection was first used by elders teaching at the Warmun Ngalangangpum School. Through the documentation of stories and production of artwork, cultural history and traditions are maintained. The Warmun Community Collection remains of utmost importance the local Warmun community and Gija People and is of international significance. During the recent flood, about 50% of the Warmun Community Collection was immersed in floodwater. Luckily the Collection was contained within a room at the Art Centre that prevented the works from being washed away, unlike many of the other artworks at the Centre. However, the Community Collection still sustained humidity and water and mud damage. Maggie Fletcher, the Warmun Art Centre Manager and her husband, Gary, packed the flood damaged collection, which, with the assistance of workers from the nearby Argyle Diamond mine, was then transported by helicopter to the safety of an air conditioned and secure building in Kununurra. Roads were closed due to flooding and air transport was the only quick option. The University of Melbourne's Centre for Cultural Materials Conservation (CCMC) Senior Conservator, Marcelle Scott and PhD student, Lyndon Ormond-Parker traveled to Kununurra to undertake urgent conservation work and documentation of the collection. Approximately half the collection was identified as requiring further conservation treatment and these objects have been relocated to the Centre for Cultural Materials Conservation at the University of Melbourne to be assessed and treated by the conservation team. 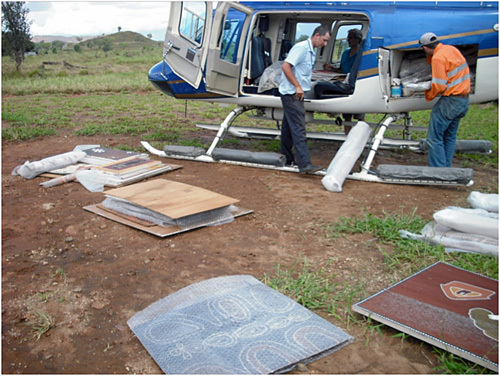 Argyle Diamonds also assisted with the triage and packing of art works to Melbourne and continue to provide support until the works can be returned to Warmun. Cathy Cummins of Waringarri Arts Centre contributed on the ground liaison with the Warmun community who had been relocated to Kununurra, and provided staff and support on the ground in Kununurra. The Association of Northern, Kimberley and Arnhem Aboriginal Artists Inc (ANKAAA) provided coordination and planning for emergency conservation of the collection. Staff assisted with collection triage, packing and cataloguing of the collection in Kununurra. The transporting of the Collection to CCMC in Melbourne was organized by ANKAAA. Custodian elders of the community were consulted and informed about every stage and planning for proposed treatment of their collection. They also received written assurance that the collection will return to Warmun as soon as possible. Toll Express sent a refrigerated truck from Darwin to Kununurra with empty crates and packing materials supplied by the Museum and Gallery of the Northern Territory (MAGNT) for the purpose of packing the collection for road transport. Toll Express's NT Regional Development Manager, Greg Elkins generously arranged for the transport by road of the collection from Kununurra to Melbourne at no charge. Upon arrival in Melbourne, The Collection was carefully unpacked and slowly dried under controlled conditions. Staff and students are currently undertaking conservation treatment of the collection which includes initial removal of mould; removal of mud and debris; consolidation of flaking and friable paint. Once these essential treatments have been completed, structural repair work such as re-stretching of works on canvas and reconstruction of distorted and delaminating prepared artist's boards has been undertaken. All proposed treatments were discussed and approved by community representatives prior intervention and all conservation work is carefully documented. In October, five community elders visited CCMC, University of Melbourne to see how the conservation project was progressing. We thank them for making the trip (Melbourne weather was horribly cold and rainy) and taking the time to inform us about their art and conservation approaches. "Handing back a cultural treasure," on Bush Telegraph, Radio National Friday 14 June 2013 [Online] Cited 26/06/2013. Warmun and the return of the community collection. Smith, Birdie. "Blood and ochre save Kimberley's art legacy," in The Age, May 18, 2013 [Online] Cited 26/06/2013. Warmun Symposium and Gija artist collaboration with CCMC 16-18 May 2013. Anon. "Warmun Art -Down But Not Out!!" (155kb pdf) [Online] Warmun Art Centre website – media centre, April 2011. Cited 21/12/2012.